We’re delighted to introduce you to our 1 Million Strong technology implementation partners. These organizations – Mandarin Matrix, the University of Oregon and VIPKID –have partnered with us to increase access to Mandarin language learning in the US by offering online programs and new technology platforms, and they collaborate with our other implementation partners that focus on school curriculum and teacher training. 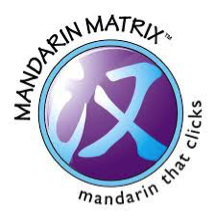 Mandarin Matrix delivers an online platform that helps K-12 students increase their Mandarin fluency and literacy. The cloud-hosted platform is built around more than 700 books, exercises and tests that make learning fun and engaging for students, and offers learning components for teachers and parents. The program’s materials are customized to suit multiple types of curricula, are aligned with the National Council of State Supervisors (NCSSFL) and American Council on the Teaching of Foreign Languages (ACTFL) Can-Do Statements – which provides tools for learners to chart their progress and proficiency levels – and are endorsed by the Confucius Institute Headquarters in Beijing. The University of Oregon and its Center for Applied Second Language Studies (CASLS) provide LinguaFolio Online (LFO), an online language learning portfolio that enables students to showcase their progress and increase language proficiency. Students set goals based on the NCSSFL-ACTFL Can-Do Statements, track their progress and upload work samples. Teachers can then quickly evaluate students’ strengths and weaknesses and tailor instruction to improve students’ Mandarin language skills. VIPKID, an organization that works to provide the American elementary school experience to Chinese children, is developing an online platform that will allow American children to connect and make friends with their Chinese peers. Whether accessed through WeChat – join our Official Account if you haven’t yet! – Skype or Zoom, VIPKID’s platform will give US students another opportunity to practice their Mandarin online and with friends. Not only will our partners help us reach our 1 Million Strong goal – to see one million US, K-12 students learning Mandarin by 2020 – they’ll also help provide educational opportunities and technology to rural and underserved communities. It’s an honor to be working Mandarin Matrix, the University of Oregon, VIPKID and our implementation partners – and all of our supporters and partners – to strengthen US-China relations.